The African National Congress is extremely disturbed and outraged by the distasteful and indecent manner in which Brett Murray and the Goodman Gallery in Johannesburg is displaying the person of Comrade President Jacob Zuma. This disgusting and unfortunate display of the President was brought to our attention by one of the media houses and we have physically confirmed this insulting depiction of the President. We have this morning instructed our lawyers to approach our courts to compel Brett Murray and Goodman Gallery to remove the portrait from display as well as from their website and destroy all printed promotional material. We have also detected that this distasteful and vulgar portrait of the President has been displayed on a weekend newspaper and its website, we again have instructed our lawyers to request the said newspaper to remove the portrait from their website. It is in our view and we remain steadfast in that the image and the dignity of our President as both President of the ANC, President of the Republic and as a human being has been dented by this so-called piece of art by Brett Murray at Goodman Gallery. We are also of the view that this distasteful depiction of the President has violated his individual right to dignity as contained in the constitution of our country. 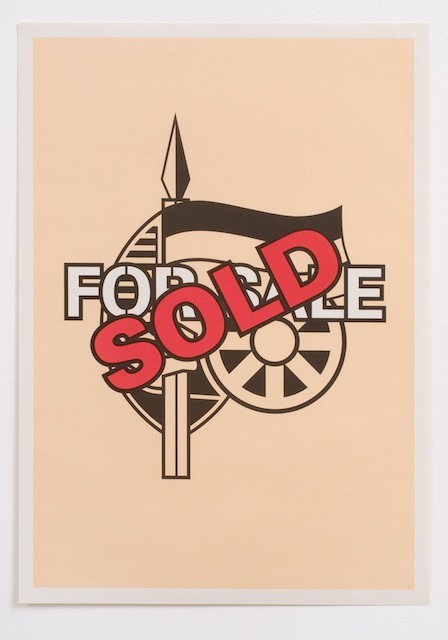 The same gallery has displayed the logo of the ANC without the permission of the ANC, with the inscription FOR SALE on it, both these portraits are a clear calculation to dismember and denigrate the symbols and the representative of the ANC, chief amongst them, the President of the ANC. The ANC believes in both freedom of the press and artistic expression. The vulgar portrait and the dismembering of the ANC logo by Brett Murray is an abuse of freedom of artistic expression and an acute violation of our constitution, apart from being defamatory. That is why we have instructed our lawyers to approach the courts in-view of these violations and the defaming nature of the so-called President Zuma portrait titled ”The Spear”.